Unless you are a member of a flat Earth society (not the band) you will agree that the Northern Hemisphere - that half of the Earth that is north of the Equator - is, at this moment (21 Jan 2019), moving toward the mid-point of the winter season. Thus, there is no better time than the present to present (See what I did there?) some information about those noggin and sit-bone-saving granules of metallic salts known as ice melt. 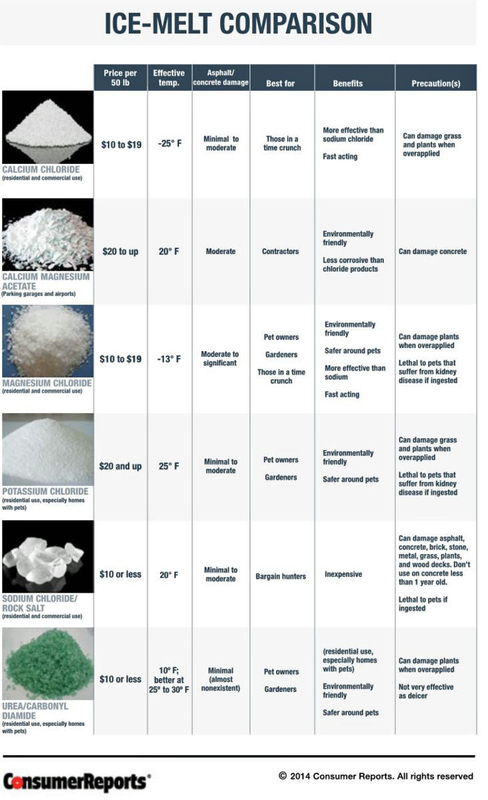 A few years ago, Consumer Reports (www.consumereports.org) produced a comparison table that identifies the most common ice melt products, as well as their characteristics and recommended uses. That table is presented here for your review, without permission (sorry, CR - but, you get all of the credit). So, what is happening when we apply ice melt products? We all know that, generally, water freezes at 32°F (0°C or 273.15 Kelvin). Water can be super-cooled well below its freeze point, before it becomes a solid, but that is a subject for another post. Liquid water molecules, which are in constant motion, begin to slow down as the temperature declines. The freezing point is the point at which the molecules slow down enough to succumb to their inter-molecular attractions and make the transition from a liquid to a solid. At this temperature, there exists an equilibrium - water molecules are entering and leaving the solid state at the same rate. Enter our friends the metallic salts - ice melt. The presence of the salt disrupts the equilibrium. Fewer water molecules are available at the phase transition interface and the freeze point is depressed. Eventually, as the temperature declines further, a new equilibrium will be reached. Salt concentrations and molecular formulas both have an impact on just how far the freeze point of water will be depressed. A 10% sodium chloride solution is reported to lower the freeze point to 2°F (-6°C) and a 20% solution to 2°F (-16°C). So remember, when you use ice melt products you are giving the water a case of depression - freezing- point depression, that is. Consider environmental impact - take care around sensitive plants, consider run-off access to waterways, and the health of the soil around the areas of application, etc. J.B. Waggoner is co-founder and Managing Partner of Inovatia Laboratories, LLC - a testing and research laboratory providing services to public and private customers, world-wide. Product development, method development, reverse engineering, failure analysis, and environmental analytical services are among the firm's core competencies. Contact a business development representative today (Click Here) to explore how Inovatia may be able to assist you with your project.